Crepidotus fruitbodies are a common facet of our forests every fall and winter. 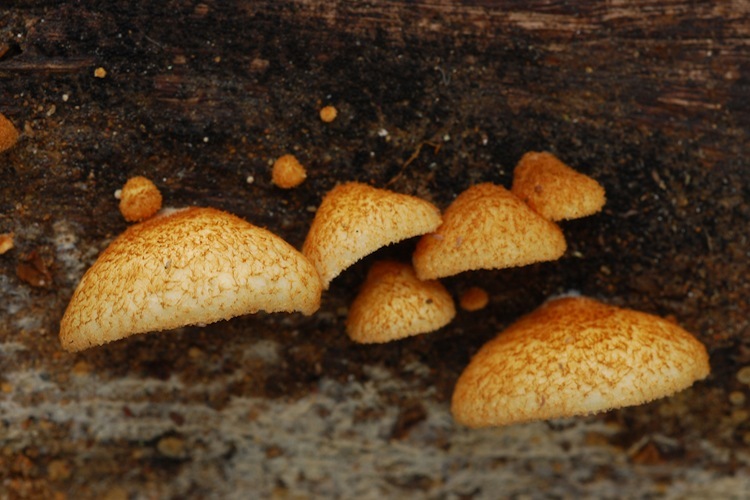 The small wood-dwelling, gregarious, fan-shaped fruitbodies with variably hairy or fibrillose caps are easily recognizable with some familiarity. The brown spore deposit sets them apart from the other woodrotting genera that produce gilled, fan-shaped fruitbodies (Pleurotus, Phyllotopsis, etc.). Saprobic on decaying wood of a number of different trees, especially abundant on madrone and oak. None are good edibles and some may be toxic. Although there has been some work done on western North American species, species richness remains unclear because technical literature remains inaccessible and even then, emphasizes microscopic characters over macroscopic features. Important identification characters include structure of the fruitbodies, coloration, substrate and habitat, and microscopic characters.